Here are some (solicited) suggestions I made to my sister about approaching Shabbat observance. Going from a secular lifestyle to full-blown Shabbat observance requires significant lifestyle modifications. Adjusting to these changes can be stressful. This stress increases geometrically with the number of people affected by the shifting household rules. Marriage is a sack race. When a couple (or family) makes this transition, it is important to move together, in the same direction, at a similar pace. This requires cooperation, accommodation, and communication. Adding ritual at the expense of family harmony is short-sighted and counter-productive. In Pirkei Avot, Rabbi Tzaddok said, "Don't make the Torah a spade to dig with" Certainly it shouldn't be a sledgehammer to hit your spouse over the head with, either. The Aseret HaDibrot (usually translated "Ten Commandments, but "Ten Statements" is more accurate.) are found twice* in the Torah. We learn a lot from the subtle differences between the wording of the two. One of these differences is in the commandment to observe Shabbat. In parshat Yitro the Torah commanded us "zachor" ("remember") the Sabbath day to keep it holy. In parshat V'etchanan, the Torah instead uses the word "shamor" ("guard") the Sabbath day and keep it holy. Both of these are vital aspects of Sabbath observance. 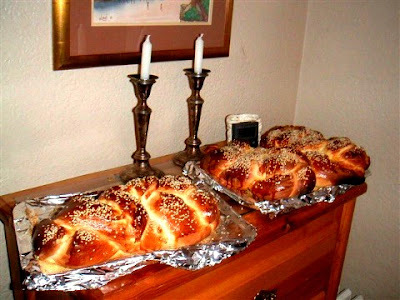 If you (or your partner) are not ready to take on the whole of Shabbat observance, try focusing less on becoming "Shomer Shabbat" than becoming, what I call, "Zocher Shabbat." If you're not ready to abstain from television for all of Shabbat, resolve to watch it mindfully. Make a distinction between watching a planned movie and watching the evening news. It matters less what the distinction is, than that you've made one. 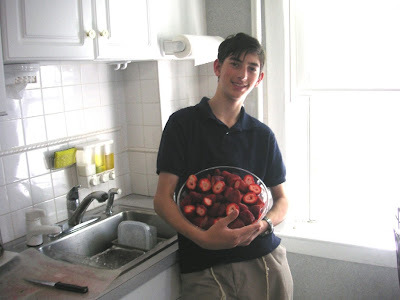 If you come across a wonderful treat during the week, set it aside to enjoy it on Shabbat. Save the most wonderful meal of the week for Friday night or Saturday lunch. If you're not up for a whole Saturday chock-a-block with synagogue services and heavy meals, don't fill it up with laundry and errands. Make Saturday morning the time for a leisurely brunch, and save the food shopping and vacuuming for Sunday, instead. prepare for Shabbat. Say to yourself, "this is for next Shabbat" as you set aside the candles on a Monday, clear off the dining room table on Thursday afternoon, buy flowers on Friday morning, etc. Imagine the week as it is in the Jewish calendar, with Sunday as the first day of the week. 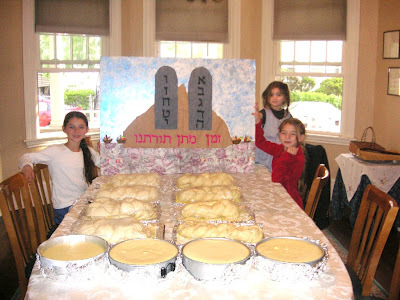 The week has a rhythm that builds to a crescendo: Shabbat is the grand finale of the week. 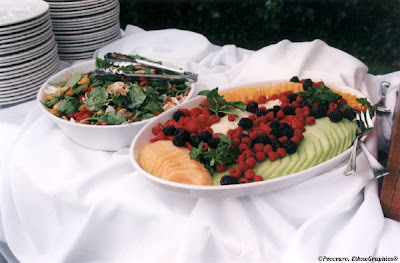 Whatever the menu, serve Shabbat meals on your nicest dishes. Sit at the table. Serve wine. Use cloth napkins. On Saturday, indulge in a late-afternoon nap. Stroll in the park instead of going to the mall. Play Frisbee. Save arguments and upsetting conversations for another day. Strive to taste every flavor of peace on Shabbat. The Zachor Shabbat approach first adds, rather than subtracts from the activities in order to distinguish Shabbat from the rest of the week. The goal, of course, is both zachor Shabbat and shamor Shabbat. However, you can't run every mile of a race at once. If the path you're on leads toward your destination, don't sweat taking a scenic path. You can't sprint in a sack race. Remember to follow this path together as a couple (or family), because, as the less-enthusiastic partner is likely to point out, it has a slippery slope. Just know that the incline, while slick, slants upward. I started keeping shabbat when I got married. 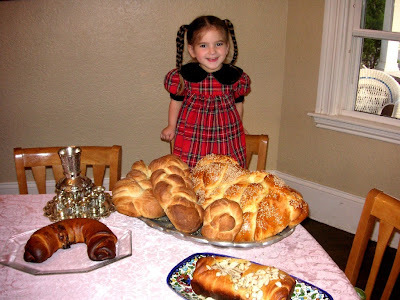 Although I enjoyed Shabbat for the first few months, I didn't "get" Shabbat - the feeling of time transformed, the oasis in my schedule, the tangible relaxation after the candles are lit, etc. 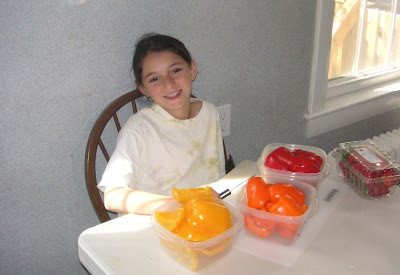 - until I had to give something up for Shabbat. It wasn't until after I refused my manager's adamant directive to work on Friday night and Saturday on a very visible project whose deadline had slipped, that I was able to feel Shabbat. 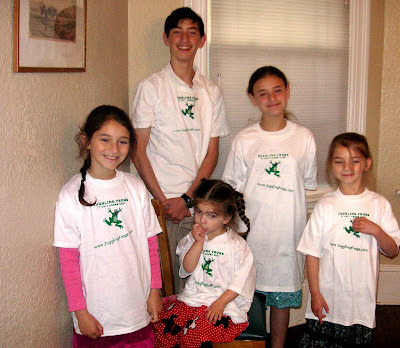 I had to defend the integrity of Shabbat's borders before the I could know the value of her contents. My manager was frustrated and angry with me on Friday afternoon. I was just out of college, and newly observant. 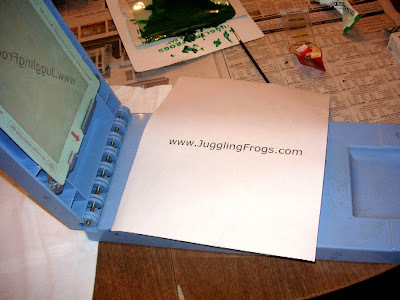 This was my first job, and I had been recently promoted from test to design. I'm a conflict-avoider in the tamest of situations. It wasn't easy. I came in as soon as Shabbat was over, and worked late into the night. I returned early Sunday morning and continued to debug the problem. I couldn't figure it out. It was very scary. I was sure I was going to be fired. On Monday, I learned that, had I come in that Shabbat, the problem would not have been solved any sooner. The problem I was supposed to solve wasn't in the software I owned, but in an area of code that belonged to a different department. It was broken in such a way that I would not have been able to detect it from my lab. My boss was relieved, and enthusiastically thanked me for "working all weekend." I heard him on the phone with the other department's manager later that day, telling him that he (the other department's manager) should thank me for my hours. That was twenty years ago. 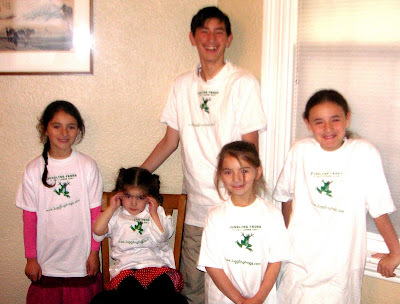 I have been reaping the benefits from that weekend, and from every other time that I have had to sacrifice some activity in order to observe Shabbat, ever since. I've found there can always be something so pressing that compromises with Shabbat's boundaries seem the most expedient path. Just like quitting smoking, just like diet and exercise, just like resisting the snooze button, the long-term rewards are easily obscured by the tyranny of false urgency. Observing Shabbat has shown me that, while there will always be another software bug, another overdue project, another frustrated manager, another overflowing inbox, another quotidian emergency, there will never be another NOW. Clearing away time for Shabbat renews this perspective every week. I think I would never have understood this, without my "moment of choice". And on the seventh day, our Jewish guinea pig rested by Jon Papernick, who tried out one shabbat in his quest to become "the Perfect Jew"
Rabbi Arthur Green’s Ten Commandments of Shabbat is a list from a non-Orthodox rabbi, geared toward non-Orthodox Jews, a guide to adding Shabbat to the week. ז זָכוֹר אֶת-יוֹם הַשַּׁבָּת, לְקַדְּשׁוֹ. יא שָׁמוֹר אֶת-יוֹם הַשַּׁבָּת, לְקַדְּשׁוֹ, כַּאֲשֶׁר צִוְּךָ,ְה' אֱלקַיךָ. Observe the Sabbath day, to keep it holy, as the LORD thy God commanded thee. by Juggling Frogs at 7:16 PM 5 comments, so far. Add yours now! by Juggling Frogs at 2:56 PM 0 comments, so far. Add yours now! 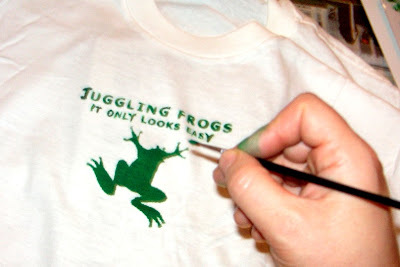 by Juggling Frogs at 7:29 AM 7 comments, so far. Add yours now! 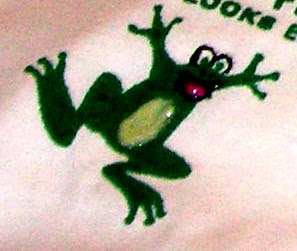 by Juggling Frogs at 11:01 PM 1 comments, so far. Add yours now! by Juggling Frogs at 6:38 PM 10 comments, so far. Add yours now! The number of letters in each of the utensil names matches the side of the plate to which it belongs. FORK has four letters in it, which corresponds to the four letters in LEFT. KNIFE and SPOON each have five letters, and they go on the RIGHT side, which has five letters as well. 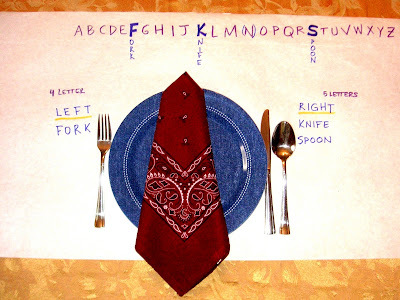 The Fork, Knife, and Spoon are placed on the table in alphabetical order. Note that this works, even when the child forgets the leading/silent K in knife and misspells it Nife. by Juggling Frogs at 10:14 AM 11 comments, so far. Add yours now! 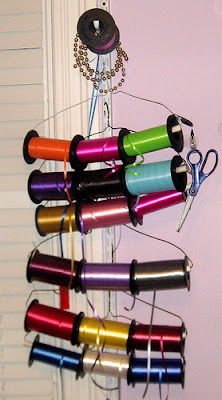 A measuring tape attached to the front-facing edge of a shelf saves so much time! by Juggling Frogs at 8:52 AM 0 comments, so far. Add yours now! 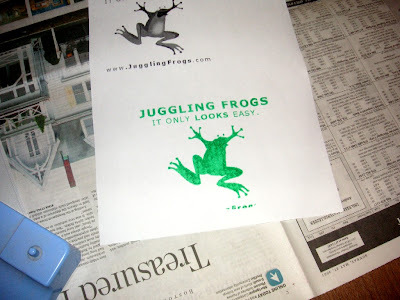 by Juggling Frogs at 3:05 PM 0 comments, so far. Add yours now! Shortly after uploading a heavily annotated description of my GTDmobile on Flickr a few months ago, a falling fire extinguisher hit me in the face, resulting in "whiplash." This put me in bed for a week. I made a number of modifications to the GTDmobile to make it more comfortable to work from bed for long stretches. I'm all better now, (thanks for asking), but the GTDmobile improvements remain. 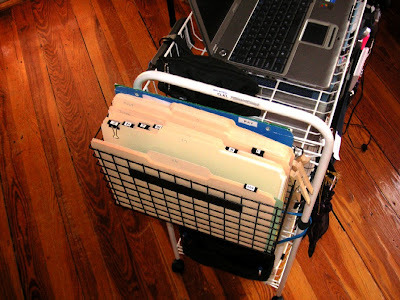 I moved the tickler file to a basket that hangs off the side of the cart. 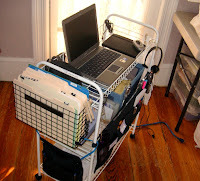 This allows more hand-room for using the laptop directly from the cart. I added labels for the pockets of supplies. When I was stuck in bed, I had to rely on help from other people. I know where *I* put the stapler. If I want other people to be able to find it, or to be able to put it away where I can find it later, then the pockets need clear labels. I added a shower curtain ring to hold a headset for the telephone. If you know anyone with a neck injury who doesn't have one of these, order one for him immediately! This was a lifesaver. I still use this all the time, now that my neck has healed. 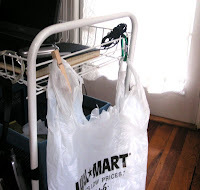 I added a carabiner to hold a plastic grocery bag, to hold trash. Eliminating the extra reach to the garbage can was a welcome improvement. 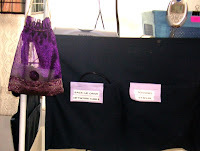 I added a bag of bookdarts, attached to the cart by a retractable badge-holder. After a week, my bed looked more like a library table than a place for sleeping. I love bookdarts! They don't fall out of the page, they don't mark the page, and they point to a specific line of text. 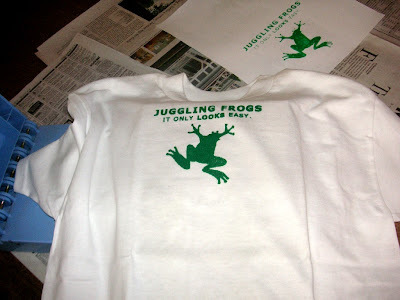 by Juggling Frogs at 7:31 AM 2 comments, so far. Add yours now! 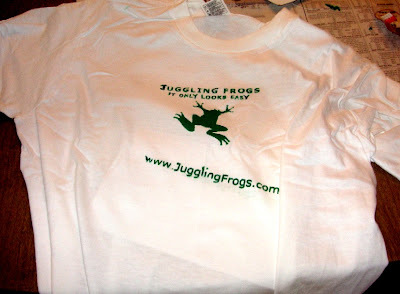 by Juggling Frogs at 7:00 PM 2 comments, so far. Add yours now! Jott is a free service that transcribes telephone messages into text e-mails. 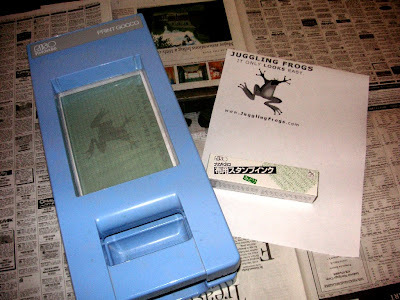 It is in beta test, and I've been using it since March, 2007. Thus, when driving parked carefully at the side of the road, I just hold down the "2" button, wait for the voice asking "Who do you want to Jott? ", answer "myself" and start talking. Whatever I say ends up transcribed in an e-mail by the time I get home. I fear for the day they will start to charge for this service, because it has become an important way for me to remind myself of things, especially when driving parked carefully at the side of the road. It wasn't until last week, however, that I set the Jott service up for blogging drafts while driving parked carefully at the side of the road. It has been such a boon! Blogspot/Blogger has an option to send a draft post to a special e-mail address. In the Jott.com configuration menu, I added this address to my list of Jott contacts, calling it "My Blog". Now, when I call Jott, I can answer either "myself" to get a to-do item in my personal e-mail, or "my blog", where whatever message I leave will be waiting on-line in my drafts folder! Here is a sample post I created by speed-dialing Jott from my cellphone, while driving parked carefully at the side of the road. I redacted my name and the link to the audio of the message, but the rest of it is as it arrived in my "drafts" folder on blogger. 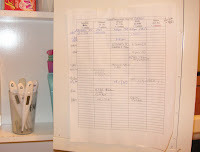 My "SchedulePad": Since starting this blog, ideas for posts flood my waking hours. This is a little device I made to help me sort out the ideas and schedule them. It has kept me from drowning in little green post-it notes and (in GTD-speak:) "empty my head" into a "reliable bucket." 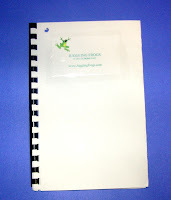 It's 8.5" x 6", about the same size as a Moleskine notebook, so I can carry it with me during the day. Texter is a text-expander that really works. It is based on auto-hotkey, but is extremely easy to set up and use. I use it to avoid typing repeated link codes, enter names in forms, and send form e-mails. I downloaded and installed it just before starting this blog. I can't imagine how many hours of typing (and re-typing) it has already saved me. 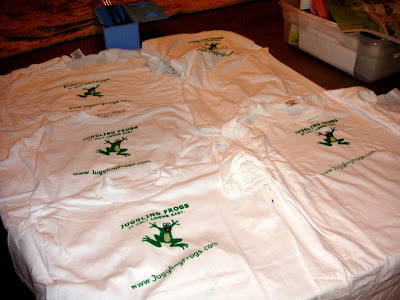 by Juggling Frogs at 10:15 PM 7 comments, so far. Add yours now! Gretchen Rubin posted this cute entry, Six dodges for pretending that you're not gossiping when you really are today. As a religious Jew, I am supposed to adhere to explicitly and broadly defined rules about avoiding speaking and listening to gossip (לשון הרע "lashon hara"). I *thought* I was doing well at this, until one day (16 years ago) when I was in a restaurant with my husband. I was giving him a summary of the upcoming week's activities; including trying to determine if we "had to" invite a certain couple to dinner. I explained that while owed them a return invitation, they would be incompatible with the other couple who was already invited to that dinner. We discussed the personalities involved, and agreed that the two couples should be invited for separate weekends. We paid the restaurant bill, and stood up to collect our coats. As we stood up, we saw that the very couple we were discussing was sitting at the next table. They were definitely within earshot. Mortified, we greeted them as politely as we could, and slunk out of the restaurant. While I didn't say anything exactly "bad" about them, I would never have spoken with a detached, analytical, know-it-all tone about their relative personality quirks, to their faces. I would never have specutlated about their relative compatiblity, or who they might enjoy as friends, directly with them. 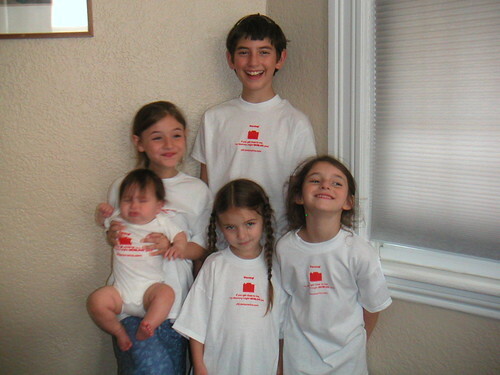 Upon review (something I have been doing for the past 16 years), we were very lucky. We liked both couples, and didn't "trash" either of them in the discussion. 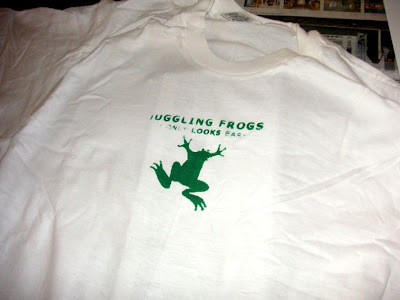 by Juggling Frogs at 9:49 AM 0 comments, so far. Add yours now! 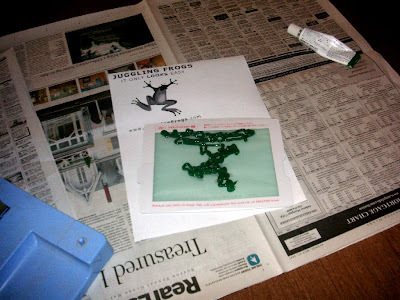 by Juggling Frogs at 6:50 AM 0 comments, so far. Add yours now! Great pizza is easy to make, using the bread machine for the dough. We can have pizza on the table less than 90 minutes after deciding to make it. One hour of that 90 minutes is waiting for the dough to form in the bread machine while preheating the oven with the pizza stones. I cheat and use jarred sauce, making homemade pizza a true convenience food. 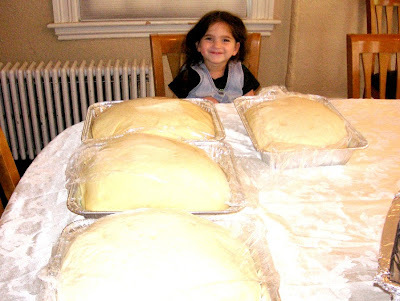 Preheat the oven with pizza stones to 500 degrees F, starting when starting the bread machine dough cycle . This way, the oven will preheat for an hour. Form the pizza circles and place the formed dough on greased pizza pans (the ones with the little holes all over the bottom) dusted with cornmeal. Spread the dough dressing on the dough with a pastry brush. Bake the naked pizza shapes for 5 minutes, remove from oven, top with sauce and cheese, and bake for another 3-5 minutes. They should be placed immediately on a room temperature pan when removed from the oven, and left to cool a bit before slicing. 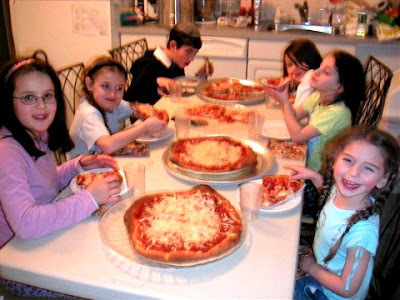 UPDATE (May 21, 2007): Check out this post on The Kosher Blog about how to get pizza-oven-temperatures from a home oven. Oy! by Juggling Frogs at 2:12 PM 4 comments, so far. Add yours now! by Juggling Frogs at 10:44 AM 0 comments, so far. Add yours now! When our children have first-time, spur-of-the-moment sleepover guests, I give the guest a fresh toothbrush from our stockpile, and label a baggie with the guest's name. 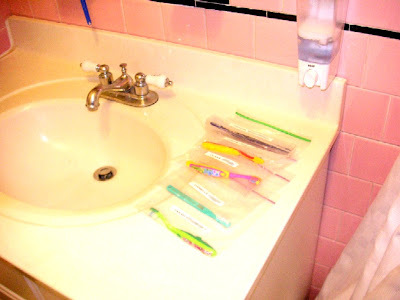 If the guest is likely to return, we keep the toothbrush, in its baggie, in our "Toothbrush Library" (a box in the medicine cabinet). The children enjoy having "their" toothbrush staying in a permanent place in our house, portending future visits. I appreciate not wasting the toothbrush! by Juggling Frogs at 12:33 AM 0 comments, so far. Add yours now! 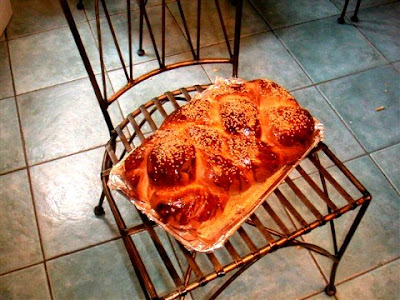 A friend called me late one Thursday night in 2004 asking for "challah counseling". 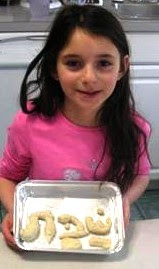 She was making challah for the first time, and it wasn't working. She had thrown out two batches. I thought I had talked her down from the ledge, but when I woke early Friday morning (to bake my own weekly challot), there was a frustration-filled e-mail message, indicating she had given up in discouragement. At 4:30 a.m., there was little I could do... Or so I thought. I remembered I had a digital camera and a moblog. I quickly threw together a "Virtual Challah Lesson", snapping pictures of each step as I made that week's batch of challah. My friend was not only able to learn to bake challah, but today she is a weekly challah baker. She has taught and encouraged others using these instructions! 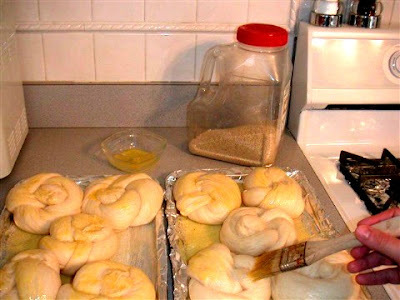 The "Virtual Challah Lesson" was meant for one person, but it helped many who found it on the web and used it in the past few years, despite the difficulty in navigation and the mis-fitting moblog format. 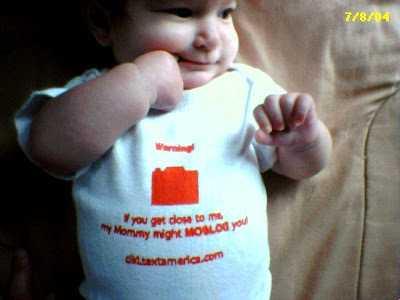 Unfortunately, some of the pictures hosted on the moblog have become corrupt over time. 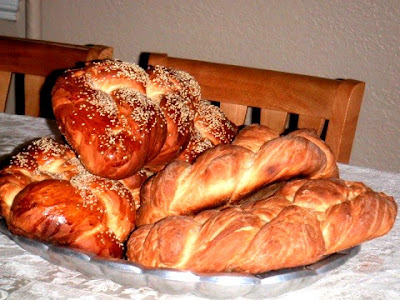 I am posting a restructured and revised version of the Virtual Challah Lesson in this format, because it is easier more conducive to instructions and recipes with multiple pictures. This version has the corrupted pitctures restored from their original photos. by Juggling Frogs at 5:58 PM 3 comments, so far. Add yours now! by Juggling Frogs at 5:53 PM 0 comments, so far. Add yours now!